PHILADELPHIA — In one corner of the visitors’ locker room, a rookie linebacker spoke softly, ruing the results of a long afternoon. “They took it to us, to be honest,” De’Vondre Campbell said, stunned by the fact that the Eagles had racked up 208 rushing yards, an ignominious total for any defense to surrender. After Sunday’s 24-15 loss to Philadelphia, the Falcons are still 6-4 and still on top of the NFC South standings, but this was a sobering defeat. To be a contender, they must win games like this. More specifically, in the event that their high-powered offense hits a speed bump again, they must be able to count on the defense. This quest is personal for coach Dan Quinn. One of the main reasons Atlanta hired him was to implement a physical, ball-hawking defense like the one he oversaw in Seattle. After 21 months on the job, how close—or far—are his Falcons from achieving that identity? “That’s a great question,” Quinn said after Sunday’s game, pausing for a beat. On the one hand, he likes what he sees in attitude and effort, which showed up in the two forced fumbles (one recovered) on Sunday. On the other hand, he mentioned technique errors, such as missed tackles (he counted six against the Eagles) and players being off on some of their run fits. Atlanta started four rookies—linebackers Campbell and Deion Jones, safety Keanu Neal and nickel cornerback Brian Poole—and at times, that inexperience was clear. Through 10 weeks of the season, Matt Ryan, Julio Jones & Co. have been racking up more than 400 yards of offense a game, the second most in the NFL. But on Sunday, an Eagles defense led by an excellent front seven stymied Atlanta. Still, the Falcons held an early fourth-quarter lead, after a 76-yard touchdown catch by Taylor Gabriel. Then the defense surrendered 10 more points in the final seven minutes. The offense missed its own share of late chances, including a rare drop by Jones, but the defense couldn’t get the Eagles off the field. Falcons linebacker De'Vondre Campbell (59) covers Eagles tight end Zach Ertz. Back in August, Quinn sat in his office clicking through training camp cut-ups, pointing out the ways he hoped the new pieces on the Falcons defense would help the unit get closer to the style of play he coached in two trips to the Super Bowl as Seattle’s defensive coordinator. He repeatedly used the words fast and physical, attributes they looked for when using three of their top four draft picks on defensive players who could help materialize his plan. That started with first-round safety Keanu Neal, who has lived up to his reputation as a tough player and a hard hitter. On Sunday, he was thrown to the ground on one play, then scrambled up to recover and make the tackle; later, he hit a little too hard on a blow to Eagles receiver Jordan Matthews that will likely draw a fine for helmet-to-helmet contact, though Neal was adamant he was trying to lead with his shoulder. Neal was drafted to play the Kam Chancellor role in Atlanta, though Quinn has been reluctant to put it in those terms. Invoking Seattle at every turn is unfair and even burdensome. That’s the challenge, after all, for coaches who branch off the tree of the Seattle defense. First it was Gus Bradley, who has yet to replicate that defensive success in his fourth (and likely final) season in Jacksonville. 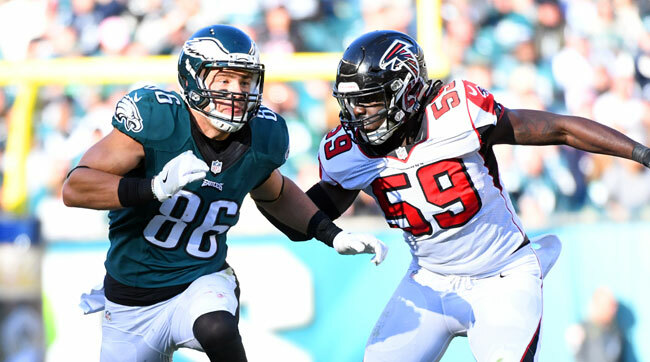 Quinn needs more time to let players such as Neal (who missed the first two games after a procedure on his knee) and second-year linebacker Vic Beasley (two sacks on Sunday) develop and coalesce together. The Falcons are already playing great offense. How far they go this season will depend on their D.
Compared to the NBA, the response to last week’s presidential election among NFL coaches and players has been nowhere near as visible. On Sunday, however, one starting quarterback made a silent but powerful gesture. The Chiefs’ Alex Smith attached a safety pin to the polo shirt he wore to his postgame press conference after beating the Panthers. It was an apparent nod to a movement that began in the U.K. after Brexit and has now caught on in the U.S. post-election, in which people wear safety pins as a show of support for immigrants, minorities and other groups who fear discrimination. Smith declined on Monday to talk about his quiet gesture, but the message he sent speaks for itself. 1. Dallas (8-1). LW: 2. No matter what, winning at Pittsburgh is no small feat. These new-look Cowboys keep passing every test. 2. Seattle (6-2-1). LW: 4. The Seahawks made a cross-country trip on a short week, against a dominant team coming off the bye, without one of their best players in Michael Bennett, and won. Scary Seattle is back. 3. New England (7-2). LW: 1. It’s only been one game, but the early returns say trading Jamie Collins wasn’t the answer for a middling defense. 4. Oakland (7-2). LW: 3. Bye week, then Mexico City game. Important for the Raiders to keep their eyes on the prize and not get distracted. 5. Kansas City (7-2). LW: 5. Every good team develops a personality. The Chiefs’ personality comes from its ball-hawking defense, as Andy Benoit expertly explained. 6. Denver (7-3). LW: 6. You heard Gary Kubiak: They haven’t lost confidence in Trevor Siemian. They’re just going to coach him harder. 7. Atlanta (6-4). LW: 6. As I wrote above, the Falcons need to win games like that one to be a real contender. But I’ll say this: when a nine-point loss is your worst loss of the season, that’s pretty good. 8. Detroit (5-4). LW: 10. You had good bye when, sitting at home, you moved into first place in the division. 9. Pittsburgh (4-5). LW: 9. The Steelers play their best game of the year, and it’s a loss. Still firmly in the camp that this is the best team in the AFC North, though. 10. Washington (5-3-1). LW: 14. One of Washington’s great assets is offensive line coach Bill Callahan. He made sure replacement left tackle Ty Nsekhe didn’t miss a beat with Trent Williams suspended. 11. New York Giants (6-3). LW: 13. One of the reasons Landon Collins slid to the second round in the draft was concerns about his ball skills. Now he has four interceptions in the last three weeks. Credit Steve Spagnuolo and his staff for some good coaching. 12. Philadelphia (5-4). LW: 17. Tremendous performance by an underrated Eagles defense to contain the proficient Falcons offense. 13. Baltimore (5-4). LW: 19. The reason I say the Steelers are the best team in the AFC North is that this Ravens offense is pretty unconvincing. Unlike 2012, the coordinator change hasn’t done much to galvanize the unit. 14. Miami (5-4). LW: UR. Cameron Wake is on quite the roll. Seven sacks in the last four games. 15. Minnesota (5-4). LW: 8. The last undefeated team in the NFL this season now hasn’t won a game since Oct. 9. They’re still tied for first in the division, but injuries continue to pile up and reserves are running thin. 16. Houston (6-3). LW: 18. 17. Green Bay (4-5). LW: 11. 18. Tennessee (5-5). LW: UR. 19. Cincinnati (3-5-1). LW: 15. 20. Indianapolis (4-5). LW: 20.